In a time when the world is filled with incredible amounts of controversy, hatred and division, it’s a breath of fresh air when a movie can help lift spirits while also breaking new ground and hopefully shattering walls that Hollywood sometimes builds around itself. The movie I’m talking about is Crazy Rich Asians, a film based off the identically titled novel written by Kevin Kwan, which took North America by storm during its theatrical release in the final weeks of the summer. The film is the first movie with an all-Asian cast and crew to be financed by a major studio this generation (with the last one coming close being the 1993 drama, The Joy Luck Club,) and with its success, it will hopefully open the doors for more films focusing on different cultures, with actors that aren’t necessarily known but best suit the parts, that harness the incredible talents and locations that these countries have to offer. I mean, in the end the focus should be on the story and how well it’s told over being afraid that it won’t be accepted because it’s not Americanized. So how does the story hold up here? Crazy Rich Asians is a fun two-hour romp through the Asian world of the incredibly rich. 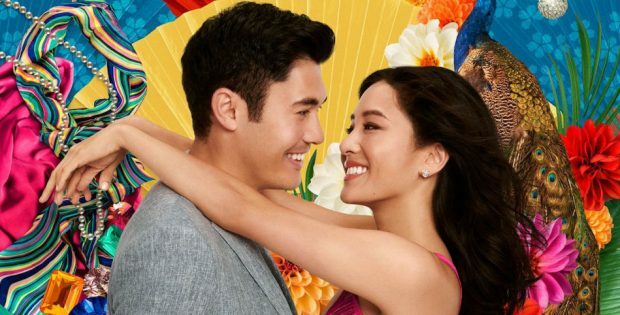 Well, the fun part comes from the fish out of water aspect to the story that sees the film’s protagonist, Asian-American Rachel Chu (Constance Wu) visiting Singapore for the first time to accompany her boyfriend, Nick Young (Henry Golding), to his best friend’s wedding. What Rachel doesn’t know is that her boyfriend’s family is ultra-rich…and by ultra-rich I mean just about as rich as one could imagine someone being, and then finding out they’re even richer than that. The fish out of water story works best here, as it allows an entry point for North American audiences to climb aboard and sort of go through what Rachel’s going through alongside her. While she’s Chinese like Nick and his family, her mother points out that she’s Chinese-American, so they’ll view her differently because they have different customs and outlooks on life. The film does a good job of laying this groundwork early, and then building upon it the longer Rachel stays in Singapore amongst Nick’s family and friends – especially when it comes to Nick’s mother, Eleanor (Michelle Yeoh), who clearly doesn’t approve of Nick’s choices in love or life. On the comedy front the movie starts a bit slow, but then picks up quite a bit once Rachel lands in Singapore and meets up with her friend from college, Peik Lin Goh (Awkwafina.) The jokes really start landing while she’s having dinner with Peik and her family, which includes the hilarious Ken Jeong as Peik’s dad, Wye Mun Goh. Jeong has incredible comedic timing that really gets things going, and Awkwafina just keeps the ball rolling throughout, constantly stealing almost every scene she’s involved in. The film’s leading man is newcomer Henry Golding, and he’s charming and handsome and plays the role of the perfect boyfriend who cares about love over money to the point where it’s believable. There are times when you almost have to shake your head at how ridiculously rich the people in the movie are, and how over-the-top the parties and eventual wedding it – but this is something that actually exists, a secret society of sorts, as the book’s author puts it during the special features. There are plenty of cons that come along with the pros of wealth, as the movie highlights quite well; however, odds are you’ll probably wish you were as rich as these people about twenty minutes into the movie – even if that means you’d have to deal with the scavengers and faux friendships that accompany it. But again, the movie does showcase quite well that some people handle having money better than others, while some just can’t find happiness with or without it. It also highlights the family dynamic within the Asian culture, and how a difference of opinions on things can be seen as a betrayal to those closest to you. While the pacing out of the gate lags a bit, director Jon M. Chu picks things up nicely once Rachel lands in Singapore and the movie really finds its footing from that point on. While it’s not necessarily breaking new ground in the rom-com genre, there’s plenty to love about Crazy Rich Asians. It’s a vibrant, visually stunning movie that’s bright and beautiful and a wonderful scenic showcase of various parts of Asia. More importantly, it’s a touching story with loads of heart, lots of culture, and plenty of laughs; but above all else, it’s the superb cast and their flawless chemistry that truly make Crazy Rich Asians something special that shouldn’t be missed. The video transfer of the film is spectacular. As mentioned above, this is a vibrant movie and the visuals are incredibly important to help give off the light-hearted, fun vibe that’s found throughout most of the movie. That’s all spot on with the Blu-ray version of the film, with clean, crisp, beautiful visuals throughout, be it day or night. The audio is also wonderfully handled, with the upbeat soundtrack pacing the film along, while never overpowering the dialogue or taking away from the comedic atmosphere. The film sounds great in surround sound, as it’s quite atmospheric for a rom-com. Audio Commentary – We’ve got commentary with Director Jon M. Chu and novelist Kevin Kwan, which is something fans of the book and movie will want to check out. There were some changes made for the movie, which Kevin touches upon, and it’s fun to learn that the film’s director was actually referenced in the book before the movie was even set to be a thing. Crazy Rich Fun – This featurette is roughly seven minutes in length and is a fun, brief watch for those who pick up the Blu-ray. It sees the cast and crew talk about bringing the movie to life, with some behind-the-scenes looks at the movie coming together. Deleted Scenes – Not a fan of deleted scenes, but there are some here for those who enjoy them. Gag Reel – For as many outtakes as I would’ve thought they’d caught on camera, this is an incredibly brief gag reel that plays mostly without audio and simply hums along to an musical track. It’s under two minutes long, so if you’re whipping through the special features you might as well hit this one up too. Warner Bros. Home Entertainment Presents Crazy Rich Asians. Directed by: Jon M. Chu. Written by: Peter Chiarelli, Adele Lim. Starring: Constance Wu, Henry Golding, Michelle Yeoh, Gemma Chan, Lisa Lu, Awkwafina, Ken Jeong, Sonoya Mizuno. Running time: 121 Minutes. Rating: PG. Released on Blu-ray: Nov. 20, 2018.